The first chapter wasn't very impressive. Felt pretty generic for Sukeno, I was expecting something more unique from him. And a 14 years-old main character ? I'm bad with protagonists so young. But I have hope that it'll get better. Then, you don't like Prince of Tennis? I haven't read it. Beside a few ones (Meguru, Teppu) I'm even worse with sport manga. I already enjoy it. 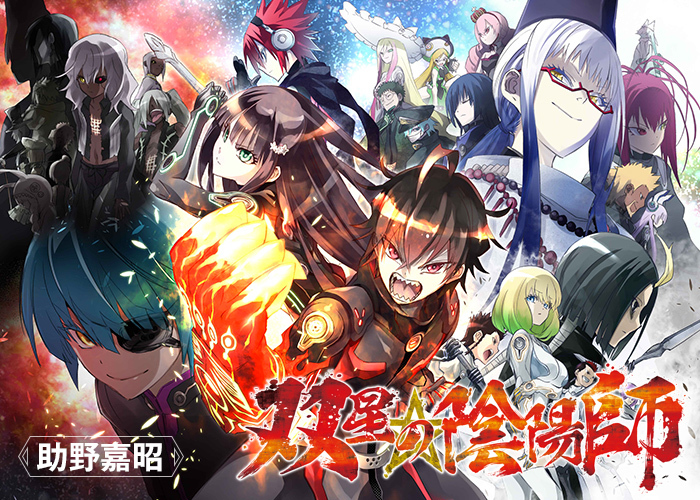 It will be cool to see how Rokuro and Benio eventually fall in love with each other and save the world by birthing their child. Edited by Blink22, 12 March 2014 - 10:03 PM. Quite a promising start. I think this can turn out into something really enjoyable. Can't wait for the next chapter already. I honestly think this had the better start than Ao no Exorcist. Benio and Rokuro working together to take on the Impurity was lovely. They have great chemistry. Chapter 6 introduces Rokuro's childhood friend. Seems she has a crush on him and is apart of his tragic past. Is she? Does it make her one of cadets from Hiinatsuki Dormitory then? But wasn't Rokuro the only survivor? No I don't think she was one of the cadets but she did help Rokuro cope with it after the tragic incident. She supported him at the time. We learn more about his past in this chapter. Also, the childhood friend informs Benio about his dark past and for some reason she feels responsible for it (which we'll most likely find out in the future). Things are going to get awkward between the two. Edited by Blink22, 19 April 2014 - 11:05 PM. I see. Do you know it from raws, by any chance? Well, that's an interesting development. Just where such a feeling can be coming from? Yes I'm going by according to what I saw from the raw scans (can't read japanese) and the summaries describing the raw chapter from members on other messaging boards. Edited by Blink22, 19 April 2014 - 11:14 PM. Is there a link to where I can find the raws? It is most likely you have to download the whole magazine. With my rather whimsical internet connection it would a bother xp I think I'll just wait till the releaze. I actually have a link to the raw scans but I'm not sure if we're allowed to post links to those types of sites on here. I'll PM it to you instead. So this story will definitely get a timeskip in order for them to give birth to the Miko. Does anyone else get the feeling that it will come sooner rather than later? Edited by Blink22, 20 April 2014 - 11:22 PM. I kinda doubt there will something like that. I think the author will hold onto that till the very end and make them fight on their own. Though I could be wrong. If so it will be one heck of a timeskip. Nah, I don't think so. The author most likely going to do a timeskip for the finale of the series, not during the middle. Doubt it, I don't think shifting the focus to a new main character on a new manga is the best way to go.